Perhaps only Linda will understand my appreciation for this bit of filing history, but it is directly related to my graduate studies of information management. Erin on unclutterer.com references a chapter concerning filing systems in an arcane book about the history of business management. Today, we all know and use systems of vertical paper files, you know, pendaflex and manilla folders. They may be organized by subject, or alphabetically or even chronologically, but the mechanical structure is the same with pieces of paper stored in a vertical position. But it wasn’t always so, and Erin shares that vertical filing was invented in 1893, and prior to that there were other systems doomed to fail. Last week Linda and I went to the Hard Rock Cafe to see Zappa Plays Zappa. We were both fans back in the day. 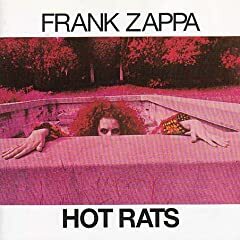 I owned two consecutively released albums with which I was most familiar: Hot Rats and Waka-Jawaka. Dweezil Z. leads an outstanding band of musicians, and he’s been doing this gig playing his father’s music for at least a couple of years. There are a ton of concert clips on youtube. We had modest seats in the balcony, but the sight lines and sound mix were very good. When they started up the show I sunk in my seat a little realizing that the avant-garde elements of Zappa’s music might get a little tedious for me. As the show proceeded I kept waiting for something familiar from my cherished albums, but it didn’t come. All the music sounded very Zappa-esque, and I recognized bits of songs here and there, particularly from Joe’s Garage. But I don’t think there was anything featured from Weasels Bit My Flesh either. post script: The next day I was listening to the Peaches clip at home while waiting on some AC repair, and the service guy came in the house and recognized the song instantly. “Is that Zappa?” he said. He was a trumpet player in his youth and was sorry to hear he missed the concert the night before. 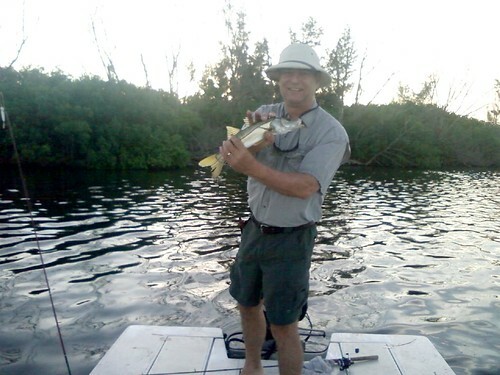 The trifecta of shallow water fishing in these parts is known as the “inshore slam“. It means catching one of each of the major sports species in a single trip. (trout, snook and redfish). I got my first slam today! This morning I went out with an acquaintance from one of my fishing lists. We’d traded correspondence a while ago and he invited me to call him up some time and he’d show me his spots. Joe lives in Sebastian and fishes almost every single day since he retired. He knows his waters real real well. My boat is in the shop this weekend, so I gave him a call and we hooked up at 5:45am this morning down at the boat ramp, and Joe put me on fish. I got a sea trout on topwater, this little snook on a gambler jerk bait, and a slot sized (23″) redfish on a gulp crab. We’re having the redfish for dinner tonight, stuffed with real crab. The doctor explained that it should be treated conservatively and prophylactically (drops and ointment) for a while to see if we can control it. If not, more ‘heroic’ treatment may be called for, eg. surgery. 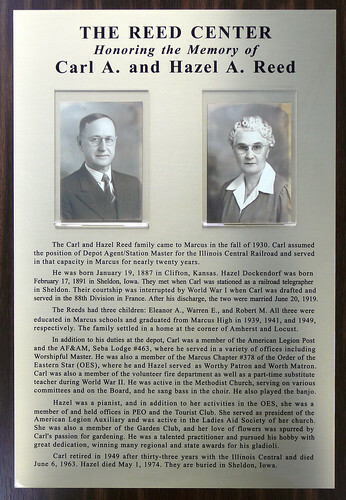 Here’s the plaque honoring Grandparents Carl and Hazel Reed of Marcus Iowa. The parents are presenting it to the Marcus Historical Society for the dedication of the Reed Center in Marcus next month. More photos here. Julia Nunes is an internet phenom who brokeout on youtube and now has a record deal and a full blown music career. The crimes of a cappella, after all, are legion and well-documented. The dumb outfits. The fact that on many college campuses, it’s always being shoved in your face. (Your roommate might have been a Level-20 Wizard in Dungeons & Dragons, but he wasn’t constantly sprawled in your entryway, forcing you to watch him roll his 12-sided die.) The bands most frequently covered on the circuit are uniformly schlocky: Coldplay, Maroon 5, Billy Joel, Journey. Perhaps most damning of all is the fact that a cappella is so painfully earnest, so distressingly eager to please. read more. 7/19 update: just saw this compilation of the Funniest A Capella on the Web (sic), and its mostly college groups. Check out the mormon (BYU) white boy choreo to Thriller!